I was standing in line at Target yesterday waiting to buy my groceries. A mom with her little girl who looked to be 7 yr. old was in front of me. I watched as the little girl patiently waited. As I watched her I heard in my heart "give that little girl $5". I rarely have cash but thought if I had a $5 bill in my purse I would give it to her. I DID have one. My heart started beating fast and I was so excited to do this! I told her mom I had been watching her daughter and how sweetly she was waiting for her mom to finish purchasing her groceries. I asked if I could give her the money I held in my hand for Christmas. The mother smiled and acknowledged that I could. I walked over to the little girl, talked to her a little and told her Merry Christmas as I gave her the money. She never said anything but her smile said it all. I talked to the mom about what a sweet girl her daughter was and turned to pay for my groceries. 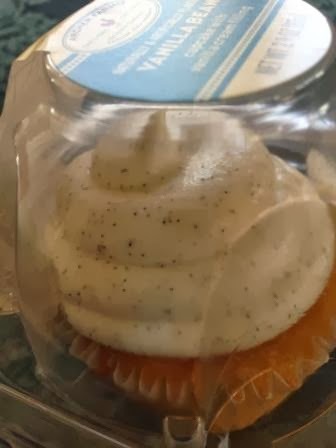 The mom turned around and gave me a cupcake that she had just purchased. She told me her daughter wanted me to have it and Merry Christmas. I was so touched by her kindness. As I was thanking the little girl her smile grew larger. This all took place in just a few minutes and was a small act, but the blessing that came from it will last much longer. Each of us are affected by a touch of kindness...either by giving or receiving or like this situation by both. I'll never really know how the exchange I had with this family touched them but as I listen to God and allow Him to lead me I can know that it is in His plan for us to show love to others.